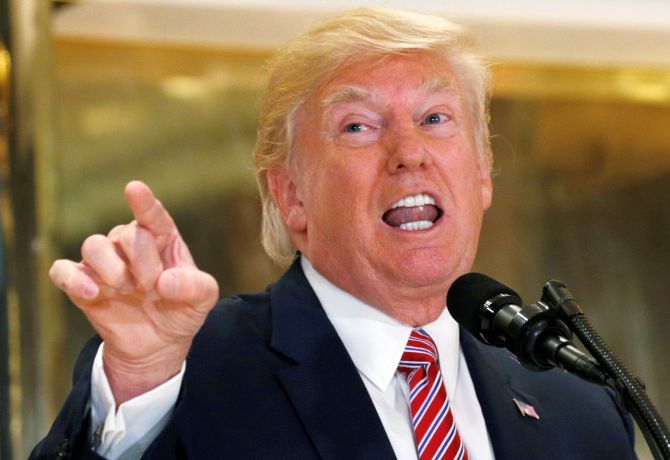 Amid a political storm over his position that ‘both sides’ were at fault for the violence in Charlottesville, a combative United States President Donald Trump said that he has “no doubt” over his comments. 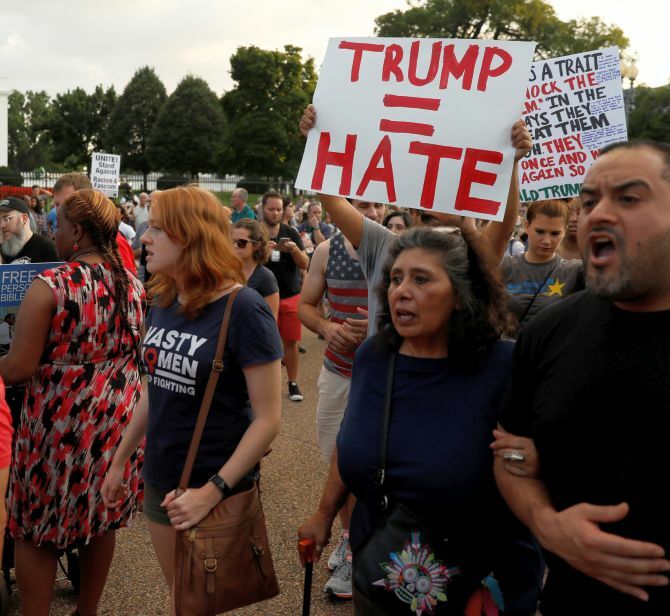 The US President reverted on Tuesday to his initial position that both left and right-wing extremists became violent during a weekend rally by white nationalists in Virginia. He has blamed both sides including the “alt-left” for the deadly violence. Trump had come under fire from both Republicans and Democrats for his muted response to the violence unleashed by white supremacists during a rally in Charlottesville in which a woman was killed and 19 were injured when a car ploughed into a crowd of counter-protesters. “I think there’s blame on both sides. If you look at both sides -- I think there’s blame on both sides. I have no doubt about it, and you don’t have any doubt about it either. And if you reported it accurately, you would say,” Trump told reporters at an impromptu news conference at Trump Towers in New York. When a reporter challenged his observation by saying that this was started first by neo-Nazis groups, Trump said that both sides are to be blamed. “Excuse me, excuse me. They didn’t put themselves – and you had some very bad people in that group, but you also had people that were very fine people, on both sides. You had people in that group,” he said. 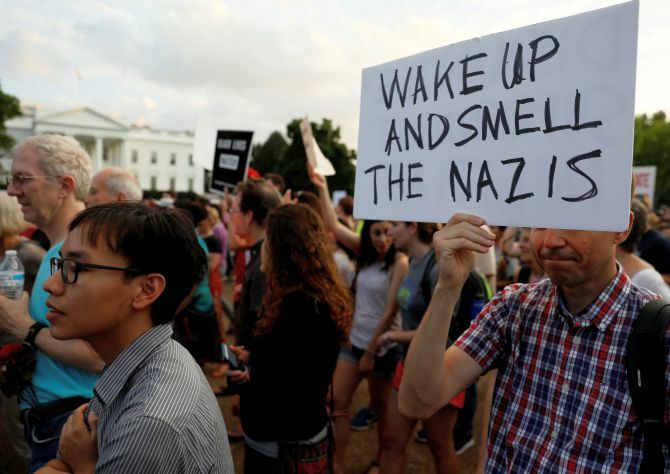 “You had a lot of bad people in the other group,” he said, adding that a night before, the white supremacist groups took out a peaceful rally in Charlottesville. “There were people in that rally -- and I looked the night before -- if you look, there were people protesting very quietly the taking down of the statue of Robert E Lee. “I’m sure in that group there were some bad ones. The following day it looked like they had some rough, bad people -- neo-Nazis, white nationalists, whatever you want to call them,” he said. “But you had a lot of people in that group that were there to innocently protest, and very legally protest -- because I don’t know if you know, they had a permit. The other group didn’t have a permit. So I only tell you this: There are two sides to a story. I thought what took place was a horrible moment for our country -- a horrible moment. But there are two sides to the country,” Trump said. “What about the alt-left that came charging at -- excuse me, what about the alt-left that came charging at the, as you say, the alt-right? Do they have any semblance of guilt? Let me ask you this: What about the fact that they came charging with clubs in their hands, swinging clubs? Do they have any problem? I think they do. As far as I’m concerned, that was a horrible, horrible day,” said the US president. Trump’s impromptu press conference in New York resulted in immediate outrage among his political opponents. “The President’s press conference made plain that the statement he gave on Saturday is what he really believes. “The President’s continued talk of blame ‘on many sides’ ignores the abhorrent evil of white supremacism, and continues a disturbing pattern of complacency around acts of hate from this President, his Administration and his campaign for the presidency,” said Nancy Pelosi, former Speaker of the US House of Representatives. “From the beginning, President Trump has sheltered and encouraged the forces of bigotry and discrimination. “We have seen the manifestation of this behaviour in the hiring of White House staff members, but also in the unmistakable conduct of his Administration toward immigrants, Muslims, and communities of colour,” she alleged. “Great and good American presidents seek to unite not divide. Donald Trump’s remarks clearly show he is not one of them,” said Senator Charles Schumer, Senate Minority Leader. “By saying he is not taking sides, Donald Trump clearly is. When David Duke and white supremacists cheer your remarks, you’re doing it very, very wrong,” he said. House Democratic Caucus Chairman Joe Crowley said Trump has “disgraced the office of the presidency” and “clearly lacks a moral compass”. “A president who should be representing the party of Lincoln has instead chosen to stand with white nationalists, neo-Nazis, and domestic terrorists. It is beyond the pale,” Crowley said. Senator Mark Warner said he is shocked and disappointed. “I’m shocked. I’m disappointed. I tried to give the president the benefit of the doubt on Monday. 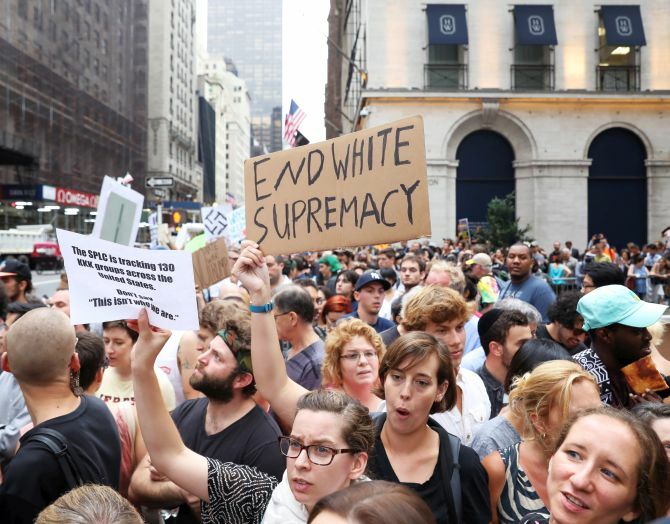 I was disappointed it took him more than 2 days to call out the vile actions of people who were racist, white supremacists, neo-Nazis, Ku Klux Klan members that descended on Charlottesville,” he told CNN in an interview. Virginia Governor Terry McAuliffe contested Trump’s statement. “Neo-Nazis, Klansmen and white supremacists came to Charlottesville heavily armed, spewing hatred and looking for a fight. “One of them murdered a young woman in an act of domestic terrorism, and two of our finest officers were killed in a tragic accident while serving to protect this community. This was not ‘both sides’,” he said. Someone vandalised the Lincoln Memorial, the National Park Service said. 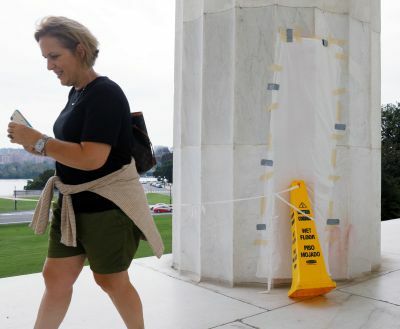 The words “F--- law” were found written in red spray paint early Tuesday on a pillar at the monument that overlooks the Capitol building and National Mall, NPS said Tuesday afternoon. The graffiti was found about 4:30 am. “It’s frustrating, not only for the Park Service but certainly for the visitors that come here, that anyone would vandalize any of our iconic memorials. Especially the Lincoln Memorial. Especially with everything that’s going on now -- the calls for unity and people to come together,” NPS spokesman Mike Litterst said. “To go to the site of the memorial to Abraham Lincoln and do that, that’s disappointing,” he said. Is India Most Racist country in the world?